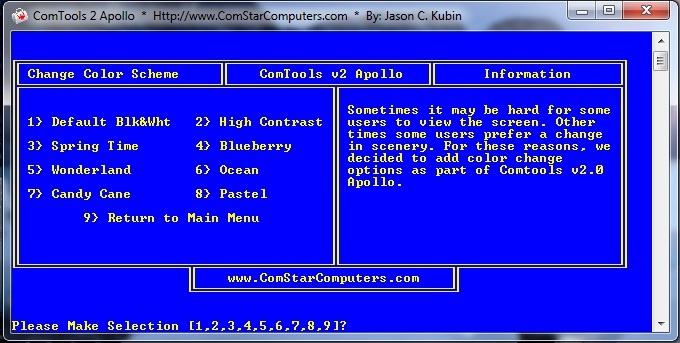 ComTools v2 code named Apollo is ready for use and testing. We ask that you report any bugs HERE. Please keep in mind that we are still fine tuning and tweaking Apollo to ensure flawless use. It has been tested on the Windows platform but should run on Vista/7/8/10. We have been working hard and it's been a long road but we've finally finished the beta version of ComTools code named Apollo. ComTools is a toolset designed to help you remedy problems with your computer, the internet, viruses, and more. Check it out HERE! TOOLS INCLUDED: Network Settings Gatherer, Network Configuration Reset Tool, IP Address Refresher, Ping Tester, Tracer, IP Scanner, CCleaner, HijackThis, Kapersky Security Scan, Avira PC Cleaner, System Information Wizard, AntiMalware Toolkit, Disk Formatter, Disk Defragment Tool, CD/DVD Drive Ejecter, RW Eraser, Disk Error Fixer, Drive Manager, System Folder Loader, Hive Loader, Force Boot, Passive Boot, Standard Boot, System Shutdown Tool, ATF Cleaner, Shutdown Abort Tool, Color Changer, Online Center. We released ComTools in 2008 for Windows 98/ME/2000/XP as a way for us to help with telephone and internet customer support. since then it has become a widely used toolset devised to help keep your computer running smoothly without the costly repair bills associated with taking your equipment into the shop. With ComTools, you can diagnose and resolve common issues so that you may hopefully avoid bringing your equipment in for service. If ComTools cant resolve your issue, THEN it is time to bring it in. We understand that a downed computer means loss of productivity and that translates into loss of money. Time is money and we want to help keep you up and running so that your company can continue to do what it does best without the inconvience of a downed machine. Which ComTools is right for you? It all comes down to what operating system you run on your computer. 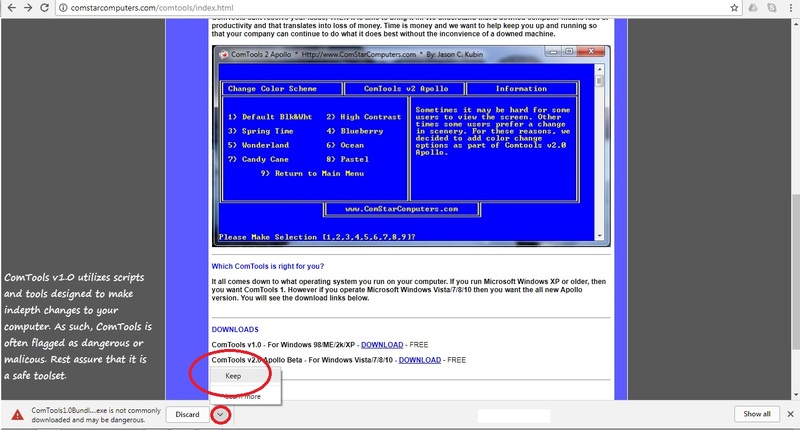 If you run Microsoft Windows XP or older, then you want ComTools 1. However if you operate Microsoft Windows Vista/7/8/10 then you want the all new Apollo version. You will see the download links below. ComTools v1.0 is being revamped. Since its release, our website has changed and has renderd the update tool inoperable. So we are rewriting that section and will be replacing the installer as soon as it's finished. The download link will be placed here. The new code name for ComTools 1 will be "Thor" and is expected to be ready before April 2016.